The Elgin Valley is not only the biggest apple growing area but there are 16 wine farms in the area. Our mountain biking day tour concentrates on two of these farms. 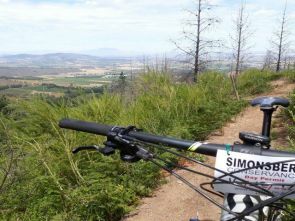 The trail takes you through beautiful natural scenery, vineyards, apple and pear orchards and is set against a fynbos backdrop on the slopes of the Groenlandberg Mountains and has it's share of surprises. 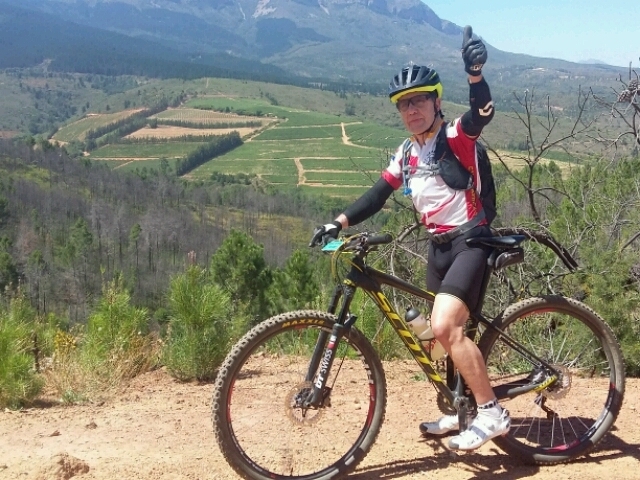 Biking Paul Cluver will leave you breathless after negotiating the many bermed barrel bridges, flowing single track and water crossings as you weave your way between the different route options. The day is not complete until the locally produced wine has ben tasting and a delicious lunch from the “Pool Room” restaurant consumed. You will get collected from your hotel and head towards Elgin, a large apple growing area over the mountain. The bike park has been built by the local wine maker, Pieter Visser, who is an avid mountain biker and this shows with a large percentage of flowing single trail offering sweet down hills and a very interesting way of getting over fences. The two estates offer 3 marked routes and a great trail network to choose from. Oak Valley: BLUE ROUTE – 14 kilometer family friendly; RED ROUTE – 22 kilometer route for the stronger riders and a BLACK ROUTE – 32 kilometer for the more advanced. Paul Cluver: RED ROUTE – 32 kilometers, BLACK ROUTE – 43 kilometers. The other option is to combine the two properties and make a full day of it. Be advised though that this option is more for the experienced riders with a good fitness level. Join us and get lost in thought as you cycle through forests of ancient oak trees, beautiful scenery, vineyards, apple and pear orchards. During the summer months Paul Cluver hosts concerts in their Hope Amphitheatre, a 600 seater natural Amphitheatre surrounded by eucalyptus trees. The Elgin Valley experience has been described as a 5 star experience and the only of it's kind in the Western Cape. You can cycle a total of 70km round trip, one of the longest single track rides in the country. After your cycle we do a wine tasting and have lunch on the estate. (Own expense) Drive back to Cape Town and get dropped at your accommodation. Today's cycle is ideal for the adventurous looking for that extra bit of fun. We use specially built mountain bike parks and single trail. Predominantly single trail but also farm roads through the vineyards and orchards and offering spectacular views of the Elgin Valley. Transfers in a climatized vehicle. Qualified bike guide for the day. How do you rate this Day Excursion?